If you’ve ever had the sneaking suspicion that something is missing from your skin care routine, you may find what you’re looking for with skin toners. These multi-application products can make a significant impact on skin health for almost all skin types. These are the best facial toners for every skin type - and they are definitely worthy of your consideration. Here’s what you’ll need to know. That’s about as straightforward a definition as they come, but to get to closer to the heart of what toners are all about, we’ve got to take a look at some of the most common ingredients that the best facial toners contain. We’ll start with witch hazel and alcohol. While not necessarily contained in all the toners you’ll find on the market, they play a big role in the ones that decide to include them. They’re astringents, which means they help constrict body tissue. This quality can come in handy in reducing the appearance of pores. You might already know that your pores can expand to release impurities. When clogged with too much dirt and oil, they become much more noticeable, detracting from your normally amazing looks. While it doesn’t actually shrink your pores, astringent helps reduce inflammation and clear away debris to leave you with skin that seems nearly pore-free. Cleaning the skin and calming your pores serves the dual purpose of protecting your skin in a more general sense. Environmental impurities will have a tougher go of penetrating your skin with your pores in such fantastic shape. A final note on astringents here. Alcohol can wreak havoc on some skin types, leaving them excessively dry. If you know you’re prone to dry skin, you might want to avoid toners with alcohol, and substitute them with a gentler option like Salicylic Acid. If even that’s too much, Lipo-Hydroxy Acid provides similar benefits with an even milder touch. Astringents aren’t the only thing you’ll find in skin toners. In one form or another, toners may also contain various extracts. Lavender is one of the most popular, and while there are some drawbacks (like the possibility of allergic reactions) the benefits often outweigh the possible risks. In addition to its soothing scent, lavender can help fight acne, heal minor injuries on the skin, prevent wrinkles, and moisturize, reducing the severity of dry skin conditions such as eczema. The various acids and extracts contained within the best facial toners help serve other purposes too, such as restoring pH balance to your skin. Skin is generally somewhat acidic, and if you wash your face with alkaline soaps, your pH balance may become disrupted. Your body will try to restore these levels naturally, but adding a toner to your routine can speed the process along significantly. Though it wasn’t always the case with skin toners (they were once notorious for drying skin out), the additional humectants found in many varieties nowadays can actually bind moisture to the skin. Furthermore, toners can leave skin feeling refreshed, and, those containing specific ingredients like alpha hydroxy acids and glycolic acid can reduce the likelihood of developing ingrown hairs. Personally, I’m a fan of the toners with natural ingredients that take it easy on sensitive skin. All-in-all, though, skin toners across the gamut have an impressive range of benefits (part of the reason so many can gain from adding them to their daily skin care routine). Let’s look at who, exactly, the main audiences for this stuff are. Who Benefits From the Best Skin Toners? To again borrow from Dr. Frank, “toners can be used by all skin types and most cater to a specific skin type.” In other words, if you have skin, there’s likely a toner out there that will help you improve it in some way. You might already be able to guess what these are based upon some of the benefits we covered above. Almost everyone will enjoy the cleansing, revitalizing, and refreshing aspects of toner. For those with oily skin, toner’s ability to mattify the skin and reduce some of that unsightly sheen is a great boon. For those with dry skin, the presence of moisturizing agents does wonders at preventing flakiness and irritation. If you’re prone to breakouts, you may find toners with lavender a welcome remedy. If you’ve been worrying about signs of aging, the antioxidants and phytochemicals contained therein should provide some protection against fine lines and wrinkles caused by the sun and environmental pollutants. Start with a cleaning and a shave — You’ll begin by cleaning your face with lukewarm water (and shaving, if it’s part of your day-to-day). Applying the toner — Make sure to use a cotton ball or cotton pad to apply your toner. Saturate your applicator of choice, then wipe it across your face and neck (while avoiding your eyes). Be sure not to rinse the toner off, instead letting it dry naturally. Technically, you can stop here, but there’s one additional step that will help optimize the effects of the toner. Don’t forget to moisturize — Toners may have some moisturizers of their own, but get the maximum benefits from these, you’ll want to follow up with a bit of your favorite moisturizer. It’s as simple as that. Now that we’ve explored how toners work and how to use them, let’s take a look at some specific options that are worth your attention. 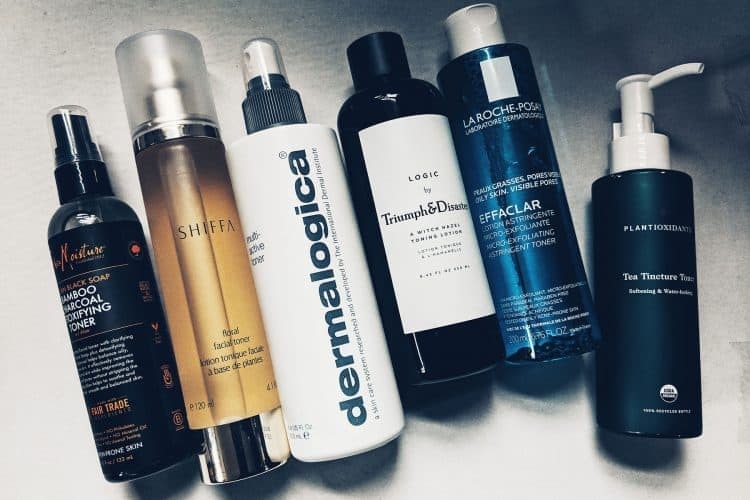 The following is a round up of several promising toner options. I’ve listed some of the ingredients for each and provided a short review of my experiences using them. The method of application is nearly identical for each toner, so the reviews will focus on the look, sensation, and performance of each product. Logic’s simple, typographic label was a definite eye-catcher, and their upfront proclamation that the product uses no Parabens, no Silicones, and is free of animal testing was a reassuring one. Sure enough, checking out the Triumph & Disaster website, I noted they were going for “simplicity, accuracy, and clarity” with the look of Logic Toner; on that front I believe they succeeded marvelously. Before using Logic, I was concerned the inclusion of Salicylic Acid and Benzyl Alcohol in the formula would dry out my skin. I’m happy to report that this was not the case (perhaps on account of the soothing Tasmania Lenceolata Extract). After applying the toner, my skin felt cool and refreshed. On my cotton pad, I could see just how much residue the toner helped remove from my skin (thanks for that, guys). Perhaps most telling about Logic, though, was the fact that my girlfriend made off with the bottle and hasn’t returned it to me since. If she loves it that much, they must be doing something right with their formula. Logic by Triumph and Disaster is a keeper. Not particularly unusual, if you recall our general skin toner directions. The fact that they called attention to it, though, made me wonder. I was starting to look a bit scruffy, so I figured ascertaining Botanical Tonique’s efficacy as a post-shave solution would be the perfect test. The toner performed well, cooling down my skin after I had gone over it with my razor. On the rest of my face, it did a great job soothing and hydrating as well. All-in-all, Pharmagel Botanical Tonique is a solid toner in spite of the somewhat generic look. The first thing I noticed about DERMAdoctor’s Ain’t Misbehavin’ Healthy Toner was how solid the bottle felt — like one of those old-school glass milk bottles, condensed into a 6 oz. size. The next thing I noticed was they emphasized the “dual alpha hydroxy formula,” which contains both Glycolic and Lactic acid, but didn’t list any other ingredients on the bottle. I had to head to their website to find out what else their toner contained, and to my relief, nothing looked surprising. I slapped a bit on my face, and noticed that the after-scent was strong, almost overpowering. The toner, though, did its job otherwise. A light tingle let me know the stuff was working, and afterward, my skin felt substantially cleaner. Guess I shouldn’t have underestimated that Glycolic/Lactic Acid blend, huh? Due to my inability to comprehend Korean, I didn’t pick up on the significance of the name at first (according to my research, “ssanai” means something along the lines of “a real man” in Korean). I also couldn’t be sure if the manufacturer just didn’t bother to list their ingredients, or if they were on the bottle and my rudimentary language skills prevented me from reading them. Never the matter, though, since I was able to look up the ingredients, and found the product relied on a combination of Hyaluronic Acid and Natural Fruit Extracts. In using it, I didn’t really feel the hydrating/moisturizing effects this “all-in-one” purports. As far as cleaning and toning my skin, however, it worked wonders, and the after-scent — a light mix of sandalwood, musk, bergamot, mandarin, and green tea — was wholly pleasant. As promised, Ssanai Face Optimizer left my skin feeling clean, moisturized and didn’t leave any sticky residue. Easy to read serif font, clear white type directly on a dark-green background (no stick-n-peel label!) — this is how you present a product, I thought. Plantioxidants was even kind enough to provide conscious consumers all the pertinent info upfront. Tea Tincture Toner is cruelty free, vegan, and free of toxins, parabens, gluten, artificial fragrances/colors, GMOs, Phthalates, and BPAs. To top it off, it’s USDA-certified organic. How does it work, you ask? Like a charm. It took the oily sheen right off my face, then left me with smooth skin that was soft to the touch for the remainder of the day. Since there’s no alcohol in this formula I didn’t get the dry burning sensation I tend to experience with other toners on the market, and the tea/fruit extracts worked together to provide a light and lovely after-scent. They’ve got it plastered up the side of the bottle, and from what I could gather, both Dermalogica and the Institute are well-respected in the field with a slew of awards under their respective belts. Fair play to them for laying all the cards out on the table in advance. That being said, the design of the bottle isn’t that bad by my standards. I’m a fan of bold type and white backgrounds. The fact that the Multi-Active Toner exceeded my expectations was all I needed to give this one a nod. A quick spritz from Dermalogica's toner spray bottle succeeded in cleaning my face and locking in some much-needed moisture, plus, the toner’s natural scent was one of the best I’ve had the pleasure of smelling. That sounded promising, and while I can’t speak with authority on all the science behind LHA, it certainly left my skin feeling less irritated than just slapping some Salicylic Acid on there would have. The subtle fragrance it left on my face was a nice touch as well, so I’ll be adding Effaclar to the “regular use” cabinet in my bathroom. Shiffa's Floral Facial Toner was by far the most “flowery” toner I’ve tried. If you don’t mind smelling a bit like a bed of roses, though, you’ll discover it also does a great job cleaning and softening skin. I was impressed by how easily it removed excess oil and dirt from my face, and the “glow” it left on my skin was healthy (but never overly-shiny). Furthermore, I’d like to point out that Shiffa has style down to a science. The bottle — classy and simple — mimicked the appearance of frosted glass. It’s also pretty solid; I accidentally dropped it on my toes and was forced into a 5-minute timeout to get my bearings straight. Definitely a great gift item. “Excess oil is outmatched,” says H20+ Beauty and their Elements “Hit the Matte” Toner. The combination of Witch Hazel and Bamboo makes for a winning formula when it comes to cleaning the skin and reducing that annoying shine. The inclusion of Ginger Root Extract works to condition the skin and soothe irritation. At least, that’s how it worked when I tried it. I was pleased with this product from the presentation to the fragrance it left behind on my skin. It didn’t aggravate my face in the least, and I received more than a few comments on how supple my skin looked on the days I was using H20+’s toner. I tried out two varieties of SheaMoisture Toner: the Matcha Green Tea & Probiotics Soothing Toner & Hydrating Mist and the African Black Soap Bamboo Charcoal Detoxifying Toner. Both, I can report, performed admirably. They lifted all the extra dirt and grime from my face, but managed to do so without stripping it of too much moisture. What’s more, neither variety had an overpowering scent — an important feature for someone with a sensitive nose like myself. I was also a big fan Shea Moisture’s commitment to providing ethical products. Both of these toners are made with fair trade ingredients, contain no Parabens, Phthalates, Propylene Glycol, Mineral Oil, Sulfates, and were created without animal testing. I spied only a few active ingredient in Yes to Tomatoes’ solution. That isn’t to say there weren’t others that played a role in the formula, however. In particular, I noticed SD Alcohol 40-B, which put me on high alert for that distinct burning sensation and eventual dryness afterwards. Thankfully, this was not the case. Yes to Tomatoes did a great job cleaning my skin, and the aftereffects were neutral, not at all aggravating like I expected. The fruit blend actually helped preserve hydration on my skin, and following the toner up with my normal moisturizer made for the perfect face-enhancing one-two combination. I’ll admit upfront that of the three Thayers toners I tried, the Unscented option appealed to me the most. While all three went easy on my skin, the smell from the Cucumber and Coconut Water varieties wasn’t my cup of tea. That being said, if you’re a fan of intense fragrances, you’ll likely be pleased by the strong, natural scents. As for the efficacy of their blends, all of the Thayers toners performed fabulously. My skin was left feeling cool, clean, and refreshed. It maintained that soft, supple feeling for the majority of the day, and, I’m happy to say, didn’t dry or irritate my face in the least. As with all things related to skincare, it's important to find the toner that best matches your skin type. If you're new to toners and want to try one out but don't know where to start, I'd recommend beginning with Thayers toners. They're a classic - and usually classics are well-loved for a reason. It's a solid all-around toner at an excellent price point, making it one of the best facial toners for nearly any skin type. If you have a specific skin concern, there's a number of specialty toners for every skin type from acne to dry skin. While it might be tempting to skip this part of your skincare routine, toner is a worthwhile step to elevate your skincare game. Dwight Hill is a grooming enthusiast, writer, photographer, designer, and musician. He divides his time between Washington, DC, and Richmond, VA, as a teacher at the Metropolitan School of the Arts and drummer for Gears of the Sun.